In spite of an epidemic of walks from 3 out of 4 of Durham pitchers — 6 in 4 2/3 innings from Torres, 3 in 1 2/3 innings from Reid, and 1 in 2 from McGee, for a season-high 10 free rides — the Bulls stayed in the game through 9 innings. In the bottom of the 9th Ray Olmedo won the game with chip shot to right and the bases loaded. In the spirit of full disclosure I will admit that I watched the game from my living room in high comfort and high definition that gave me a different view. It was sort of a warts and all closeup look I don't usually get. It left me wondering about the bandage on Chris Carter's chin, but we'll probably never know the answer. It also gave me a closer look at the full panoply of Alex Torres' mannerisms. They ain't pretty, particularly as they stretch out over several innings. In a short reliever you expect that sort of thing — last year's Winston Abreu comes to mind. But it gets old after a while. Then there's the fact that Mr. Torres simply isn't doing well. As you will see, as a group our starters leave something to be desired in recent games, so he isn't alone. But he is just about the least effective of the bunch. On the other hand, it seemed that at the end of just about every inning there were a bunch of Pawsox on base. And just about every inning ending with a flyout or ground out. My thanks to the defense. You kept the Bulls in the game. Today wraps up the Red Sox' only visit to Durham this year. This team has a lot of talent on it, even without the rehabbing major leaguers who've been giving the Bulls so much trouble. I'm not quite sure why they're in third place in the North Division. They seem to be a better team than that. My favorite 2011 Durham Bull starting pitcher, Edgar Gonzalez is on the mound for today's. It begins at 12:05 and is on national TV. Should be fun. 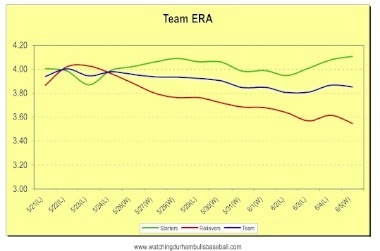 The last time we looked, May 24, overall ERA was on the rise and the starters and relievers were neck and neck. Since that moment the overall ERA has improved slightly and the Bulls have won 7 and lost 4 games. 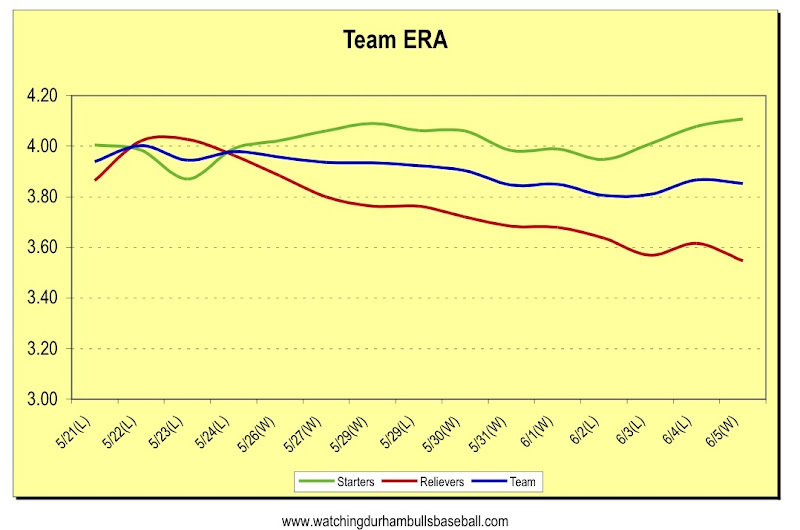 The striking change is the terrific performance of the Bulls relievers compared to the starting crew. Remember, however, that Alex Cobb is gone. He likely would have made at least two starts during this stretch. Our pitching has certainly been less than stellar recently. Dave & I listened to the game here at home last night. I regret not seeing Olmedo cinch the game for us. He's been coming through a lot for us lately. I started off rather unimpressed with him. Shows you what I know, huh? He's been doing his best to show me that I'd be better off keeping any nay-saying thoughts to myself! Yeah, where did this .300 hitting Olmedo come from? Nothing in the past years would have indicated this level of success. Don't get me wrong, I always liked the guy (remember the 2 inning pitching win a few years back), but this seems like a different player.